How can a guaranteed livable income help us to live equitably, sustainably, and peacefully? This was the central question explored in an event hosted by Sarah Mah and Thao Hoang of the feminist grass-roots organization Asian Women for Equality on the International Day to Eradicate Poverty on October 17, in Montreal, Canada. Mah served as the moderator for the evening. She initiated the panel discussion by calling attention to the relationship between environmental sustainability, women’s rights, and a guaranteed livable income. “We host these panels as feminist platforms for discussions about guaranteed livable income to bring academia, grassroots, and frontline groups together…to bring different fields together and build alliances and shared theory with each other,” Mah said. In light of the recently published Intergovernmental Panel on Climate Change report on the severity of climate change, she described how rapidly changing climate conditions disproportionately affect the most vulnerable and marginalized groups in society, especially women. “Women are already vulnerable to male violence and exploitation, and this is made worse in climate-change induced natural disasters,” she said. The first panelist was Rob Rainer of Basic Income Network Canada. Rainer argued for a paradigm shift in which basic income plays a central and inherent part. Shedding light on the already existing forms of basic income-like programs in Canada such as the child tax benefit and old age security, he drew attention to the emotional and financial security these that these programs already provide for large segments of the population. He argued that a basic income has the potential to promote and encourage citizen engagement in environmental protection. “By ensuring or improving one’s economic security, basic income decouples such security from attachment to the paid labour market and supports the pursuit of non-market work that actually may be far more important for community well-being, sustainability and survival,” Rainer remarked. For example, people might engage more in local food production, urban farming, and citizen wildlife monitoring and what about the simple, yet incredibly impactful, act of picking up the tons of plastic on our beaches and in our oceans. Yet, as Rainer pointed out, “it’s difficult to participate in this when you are struggling for survival.” A basic income could allow us to engage more sustainability with our surrounding environment, and pour more of our energy and presence into conserving, caring for, and protecting our planet. 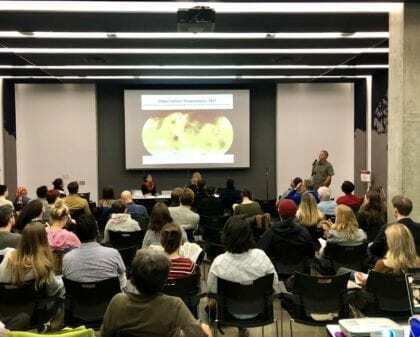 Panelist Cathy Orlando from the Citizen’s Climate Lobby, a non-partisan, non-profit organization, spoke further on the connection between environmental sustainability and a guaranteed livable income. Orlando began by showing how our pursuit for a just, peaceful, and equitable world is inextricably connected to the environment. She zeroed in on the carbon fee and dividend policy as a very promising approach for climate justice, poverty alleviation, and re-distribution of wealth. After the panelists’ presentations, a conversation took place between the panel and various community respondents including Sean Devine of Revenue de Base Quebec, Vincent Duhamel from Climate Justice Montreal, Paul Clarke from Réfugiés Montréal and Penny Beames, organizer of McGill’s Sustainability Research Symposium. They explored further aspects on guaranteed livable income and a sustainable future. 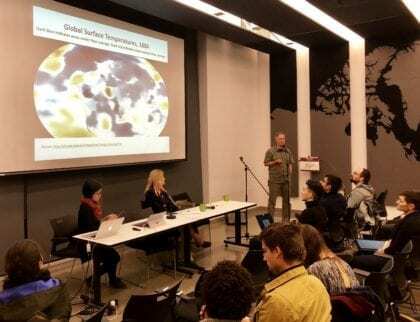 Among the issues raised was the question of how refugees figure into the discussion of a Canadian basic income – an important question in lieu of the millions of people who are, and will be, displaced because of climate change. For instance, members of the panel agreed that basic income should be granted regardless of immigration status, which Mah noted is a position held by the organization Asian Women for Equality. Another issue brought up was how a basic income would render people less prone to over-consumption. In response, the panelists reflected that a basic income could provide stability, allow self-reflection, and strengthen social networks. They offered this as a possible explanation as to how guaranteed livable income might counteract over-consumption – a central issue in any conversation about sustainability. In the end, the discussion highlighted the opportunities and challenges of a policy approach that would promote granting people an equal share of the wealth, and perhaps also protect the health of our environment. Perhaps, more of us have begun to envision what this peaceful, equitable, and sustainable world will look like going forward. Regarding consumption: currently we live in a forced production forced consumption economy due to the requirements of economic growth. When the economic goal is growth, that requires a growing amount of consumption along with increasing extraction and waste of all kinds of natural resources. A GLI actually gives humanity a way off this path of endless growth and destruction. An important topic like UBI hijacked by men hating feminist playing oppression Olympics. UBI is important due to many factors, nobody is marginalized in Canada so cut the BS and stick to the topic at hand. History is the fight between liberty and enslavement. We face a formidable enemy that enslaves us and robs us of our liberties, so we need to avoid creating divisions among ourselves. The line lies between the 0.1% (who rob our wealth through a corrupt monetary system) and the rest of us, not gender, ethnic, ages, profession, or whatever other division they encourage among us.